We’re often asked: ‘where can I get the artwork on your walls? 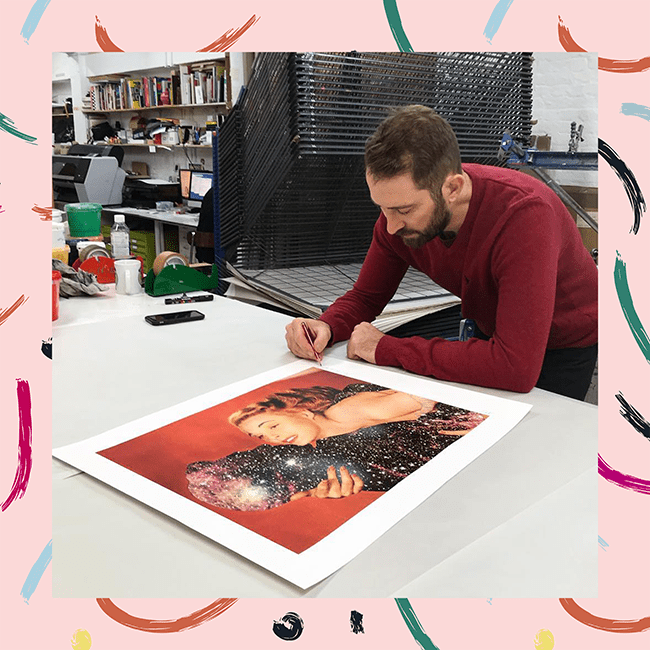 !’ And so, after much demand, we have teamed up with one of our favourite galleries Jealous, to bring you a collection of 12 signed limited edition prints curated especially for Artist Residence for our guests to shop online, with all profits donated to London charity, Art Against Knives. For those who aren’t familiar with our friends over at Jealous, they are a contemporary gallery, print publisher and screenprinting studio, based in East London’s creative hub of Shoreditch as well as in Crouch End. They are known for their collaborative approach to producing high quality limited edition prints with many artists, galleries, designers, museums and now, Artist Residence. Look out for their work at art fairs and in a number of galleries and institutions including Tate Modern, Saatchi Gallery, and The V&A. N.B. We hold them responsible for a fair bit of the art on our walls, and we’re sure you will too soon! Art Against Knives work to intervene early to prevent young people from becoming victims or perpetrators of violent crime. Through embedding creative spaces in London’s most isolated communities, co-designed with young people, that build on their strengths and create opportunity, Art Against Knives have engaged and supported over 1200 young people at risk of violent crime in London. Providing opportunity through creative outlets is something we’re passionate about. Ever since we put that ad out 10 years ago for artists to paint our rooms in exchange for board we’ve always collaborated with up and coming artists and designers, so it feels like a natural fit to work with Art Against Knives on this project and hopefully support them in engaging young people in creative projects where they might not otherwise have these opportunities. Jealous have curated the collection after studying our style and spaces, selecting each of the works to reflect Artist Residence, from the bold, colourful and punchy atmosphere to the quiet and reflective interiors. Some of the featured artists already frequent the walls across our places such as Magda Archer and Kate Gibb, with Joe Webb and Jessica Albarn even having rooms dedicated to their art at our Brighton place, and we also excitedly welcome the likes of Sara Pope, Charming Baker and Will Kingett to the Artist Residence fold thanks to Jealous’ on-point curation. Creating print editions means an artist can make their artwork available to more than just the lucky owner of an original, whilst also being at a more accessible price point which is great for those wanting to start an art collection. Whilst prints may not be the original artwork, take comfort in knowing that creating prints can be much more intricate than first thoughts, and can be considered an art in itself. Silkscreen printing, etchings, and gold leaf or diamond dust finishes are all specialities in printmaking – requiring that human touch to achieve those different textures and handcrafted feels. All 12 prints are now available to purchase from our website here, and if you fancy seeing those diamond dust and gold leaf finishes up close and in person, the Jealous Collection is on show at our Pimlico place.